Caddy is a typical sixteen year old who lives in Brighton. She is from a good family and attends private school but she wishes she was a bit more interesting like her best friend Rosie who attends the local comprehensive school. Despite going to different schools Caddy and Rosie are inseparable, that is until a new girl starts at Rosie's school. Suzanne is beautiful, funny, king and warm, and at first Caddy thinks she is stealing her best friend away from her, but after warming to her Caddy soon realises that there is a lot more to Suzanne than meets the eye and she is hurt. Very hurt. This book deals with some pretty heavy topics including abuse, mental illness and self harm. These are all very tricky topics to deal with but they are handled very well and as this book is told from Caddy's point of view it almost acts as an education as this is the first time she has ever had to deal with these types of issues. Sara Barnard writes the teenage voice incredibly well. Not once does it come across as false or try hard and I definitely remember having very similar feelings when I was sixteen. All three of the girls in the book are well fleshed out with very distinct personalities and all of them reminded me of someone I knew when I was younger. 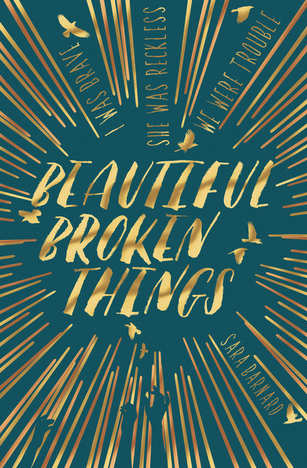 It's incredibly refreshing to see a YA book based entirely on friendships and I loved this aspect of the book. I would happily give this book to my eleven year old cousin and think that it is a good read for her. Beautiful Broken Things is a great read that will have you grinning from ear to ear but will also have you on the edge of tears. It is an easy read and flows really nicely and I think this is a great book for many different audiences.